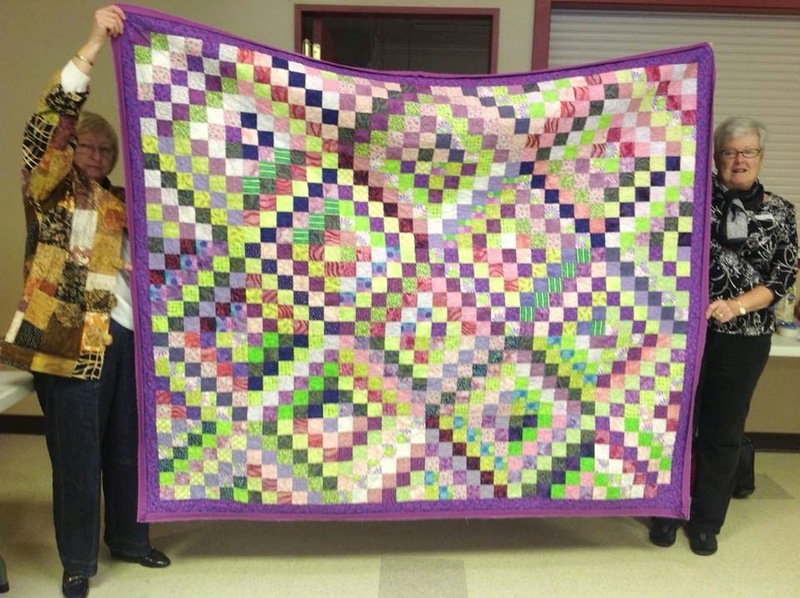 This quilt was made my mom Betty (right). It is Scrappy trips Around the World and the pattern can be found on Bonnie Hunter's Site Here. 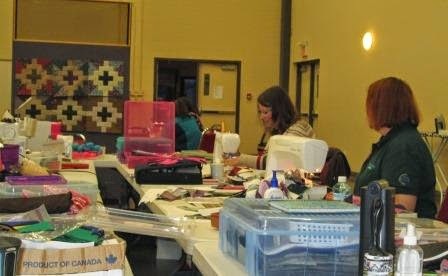 There were many done last year when there was a quilt a long. I love the purple and greens mom used. Here is mom again. A few weeks ago mom and I did a retreat together. It is the best time in the world. 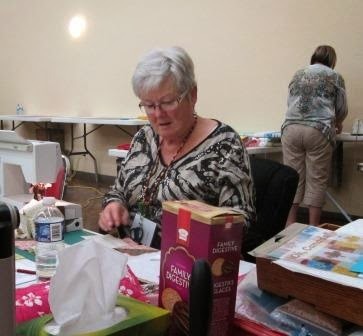 Quilting, sewing, eating and talking with mom. I thought I should show you my photos from this years retreat. It was a few weeks ago, but I guess better late then never. On the far side is my aunt Arley and the near lady is her sister, Fay. They do not live close so the retreat is a great time for them too. Mom and I have booked again next year. I kind of started two new scrap projects at retreat. First is the Lozenges, also a based on a Bonnie Hunter pattern. It is meant to be a Leaders and Enders Project. I started by just cutting a few things on the end of my table at home. Some of the fabrics have not found a home. Then I went to the orange scrap box then the Brown scrap box. 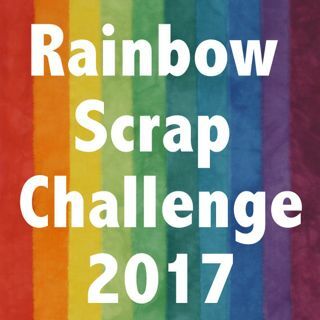 I will have to be sure there are some light Blue ones for the Rainbow Scrap challenge. I bought a new little ruler on the way to retreat (far left) so I cut some bits for another new scrap quilt. It maybe a Thousands Triangles some day. See the light blue on the top row? So at retreat I also love to collect some scraps. I went dumpster diving and shopping at the re-home it table. I found some of these scraps and then the lady cutting came by my table with the middle stack. 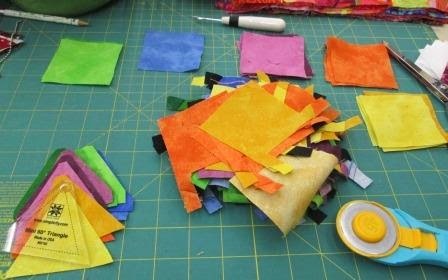 We had a fabric exchange so there were some new fabrics use in my scrap quilts. I just love having a bit of other peoples scraps. What a great fabric collection! 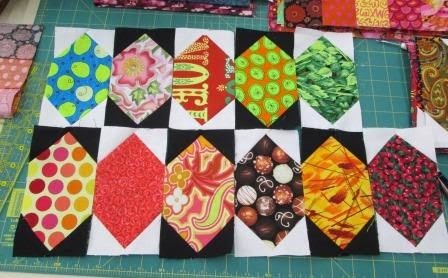 I can already picture that Thousand triangles quilt someday. I think it must be wonderful to have that creative time with your family. None of my family members are quilters - all bakers and gardeners - neither of which I am very good at - Retreats with loved ones would be lots of fun. I love your mother's green and purple quilt. Your new ruler looks pretty cool too- Thanks for sharing the photos. Oh your Mum's purple and green TAW is just delightful.